Mary grew up in Sacramento, California, and decided to move to Charleston in 2016. She is married and has two adult daughters (of whom she is very proud!) that currently live in Southern California. 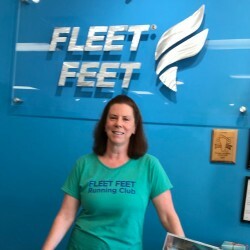 She joined Fleet Feet to share her love of running with all who would listen. Mary ran track and cross-country in high school and college but as the demands of school and career took their toll, she fell off the running wagon. She returned to train for a 10k (only) in 2004 but was again bitten by the running bug and has since concentrated on races of all lengths. Right now, Mary is part-time retired and part-time Fleet Feet employee who enjoys vacationing, gardening, reading, (and long walks on the beach - just kidding please take that out) swimming, and golf in addition to her time here at the store. She is currently working as a mentor in one of our training programs and enjoys seeing her fellow runners accomplish more than they thought was possible.